This CellML model is known to run in both OpenCell and COR. The units have been checked and they are balanced. This CellML model can reproduce the top graph in figure 2 of the original publication. ABSTRACT: Computational models of a large metabolic system can be assembled from modules that represent a biological function emerging from interaction of a small subset of molecules. A "skeleton model" is tested here for a module that regulates the first phase of dynamic adaptation of oxidative phosphorylation (OxPhos) to demand in heart muscle cells. The model contains only diffusion, mitochondrial outer membrane (MOM) permeation, and two isoforms of creatine kinase (CK), in cytosol and mitochondrial intermembrane space (IMS), respectively. The communication with two neighboring modules occurs via stimulation of mitochondrial ATP production by ADP and P(i) from the IMS and via time-varying cytosolic ATP hydrolysis during contraction. Assuming normal cytosolic diffusion and high MOM permeability for ADP, the response time of OxPhos (t(mito); generalized time constant) to steps in cardiac pacing rate is predicted to be 2.4 s. In contrast, with low MOM permeability, t(mito) is predicted to be 15 s. An optimized MOM permeability of 21 micromolar/s gives t(mito) = 3.7 s, in agreement with experiments on rabbit heart with blocked glycolytic ATP synthesis. The model correctly predicts a lower t(mito) if CK activity is reduced by 98%. Among others, the following predictions result from the model analysis: 1) CK activity buffers large ADP oscillations; 2) ATP production is pulsatile in beating heart, although it adapts slowly to demand with "time constant" approximately 14 heartbeats; 3) if the muscle isoform of CK is overexpressed, OxPhos reacts slower to changing workload; and 4) if mitochondrial CK is overexpressed, OxPhos reacts faster. Scheme of the adenine nucleotide-creatine-phosphate (ACP) module. Components of the ACP module are shown in black. Mitochondrial ATP production and the cytosolic ATPase catalyzing ATP hydrolysis are not considered to be part of the ACP module. These adjacent modules, which communicate with the ACP module, are shown in gray. The input to the ACP module is the ATP hydrolysis forcing function (ATPase), representing ATP splitting by contractile proteins and ion pumps. 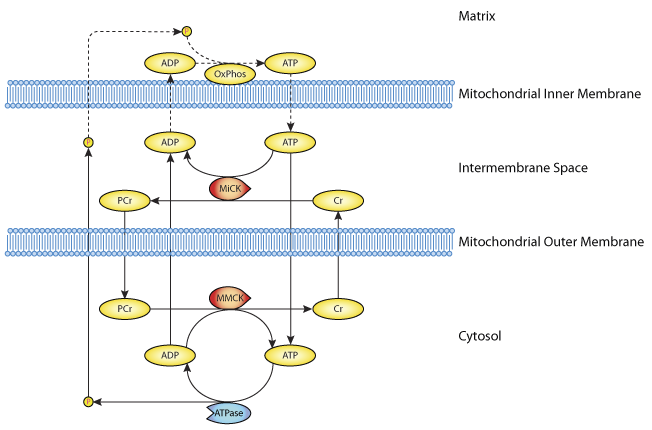 The hydrolyzed ATP is resynthesized in the mitochondrial matrix via oxidative phosphorylation (OxPhos) and exported across the mitochondrial inner membrane (MIM). The ATP production module communicates with the ACP module via uptake of Pi and exchange of ADP for ATP across the MIM. Concentration changes of ATP, ADP, and Pi are influenced by the reaction of ATP with creatine (Cr), yielding phosphocreatine (PCr) and ADP, catalyzed by isoforms of creatine kinase (CK) enzymes. CK has a muscular isoform (MM-CK) in the cytosol and a mitochondrial isoform (Mi-CK) in the mitochondrial intermembrane space. Note that Pi is not handled by CK and diffuses directly between the compartments without taking part in chemical reactions. PCr and Cr have higher diffusivity than the adenine nucleotides. The permeability to ADP and ATP of the outer mitochondrial membrane (MOM), which separates the compartments, may be restricted and is an important parameter varied in the model analysis. Derived from workspace Vanbeek, 2007 at changeset cc4f46e1303a.